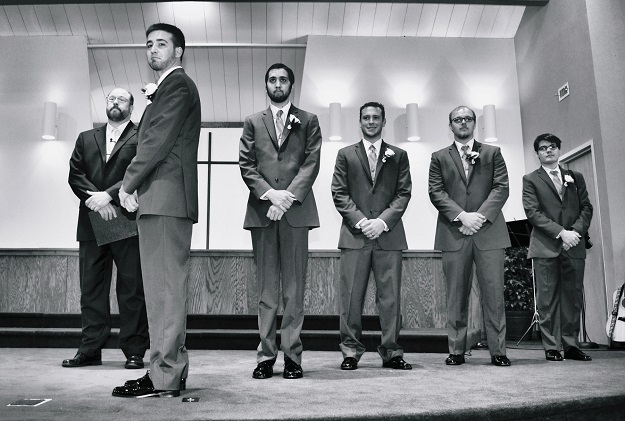 Time for more wedding pictures! I’m going to be sharing some pictures from the ceremony in this post. 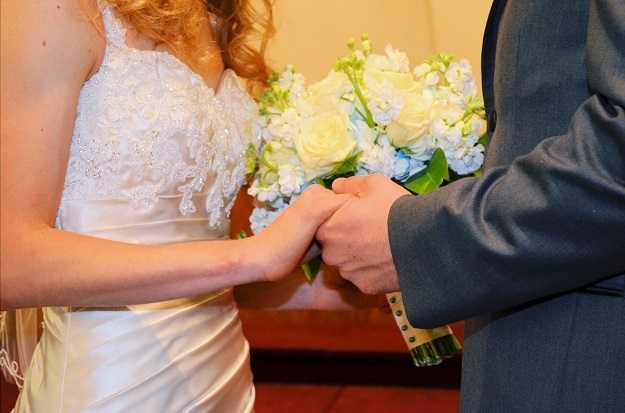 I remember our ceremony as simple and happy. 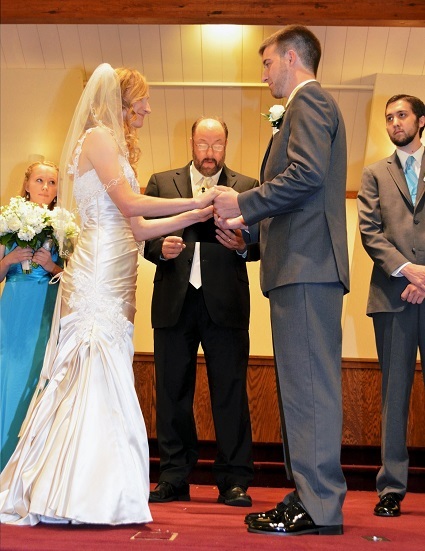 The youth minister from our church sang a beautiful love song that he re-wrote for us, our siblings read scriptures we picked out, and our preacher married us. It was truly perfect. I absolutely loved being surrounded by all of the people I love, while marrying the man of my dreams (<— I’m so cheesy, haha). 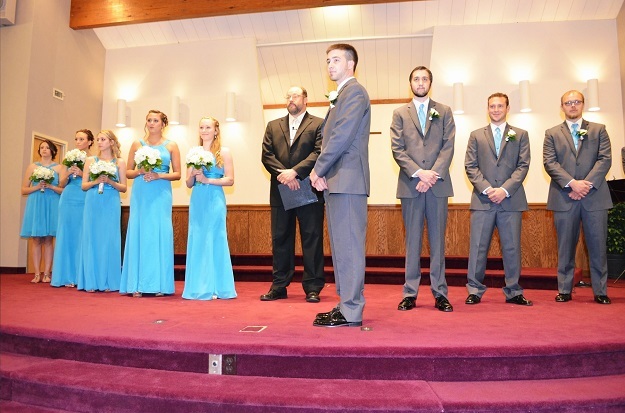 I thought it was pretty neat that mine and Jimmy’s brothers could seat our moms for the ceremony. Cool fact: Jimmy and I both have a brother and a sister. Jimmy is the oldest of his siblings and I’m the middle child in my family. 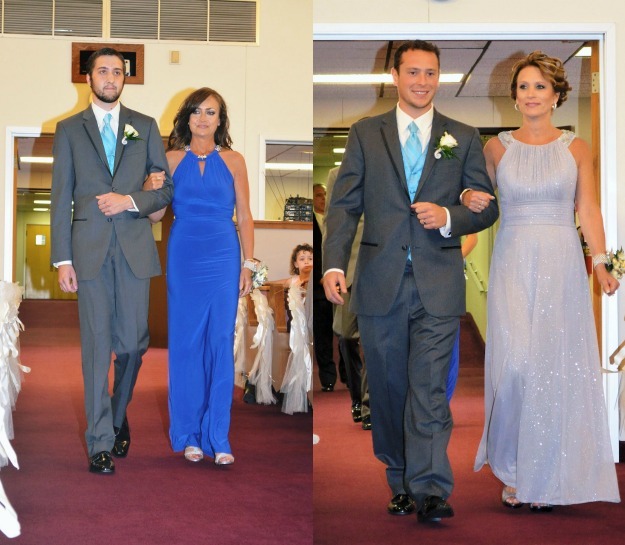 Once all of the bridesmaids and groomsmen were in place, it was time for my dad to walk me down the aisle. 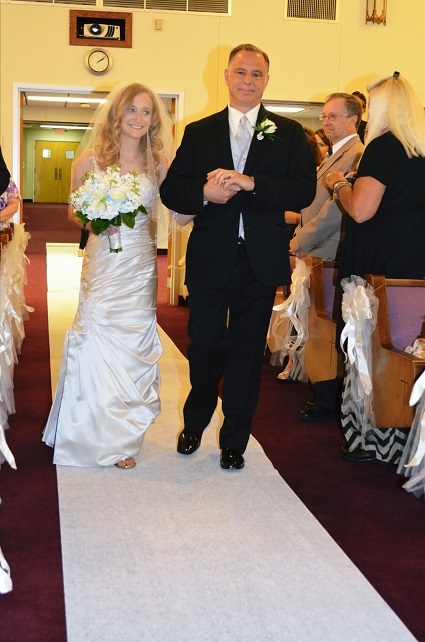 Right as the organist began playing the Wedding March, I looked over at my dad before we began walking and I saw a single tear slip down his cheek. Aaaaand now I’m crying as I remember it, haha. 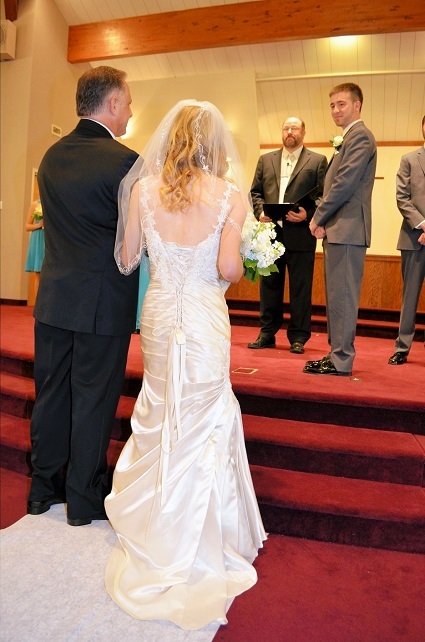 My dad and I reached the end of the aisle, he gave me a kiss, and then Jimmy flipped my veil back. It was go time! 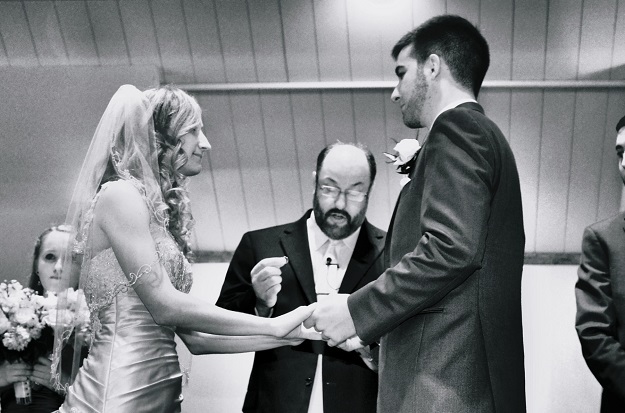 As we said our vows, and I remember feeling so excited to be marrying Jimmy. I thought about how blessed I was (am!) that God brought this amazing guy into my life over five years ago and how much we’ve grown since then. I think Hannah’s facial expression is so cute in the picture above! 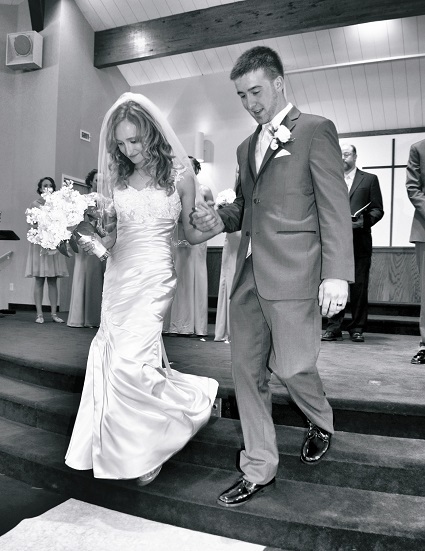 We walked back down the aisle and were hit with a wave of emotions. Relief, excitement, happiness. You know, all the good stuff! 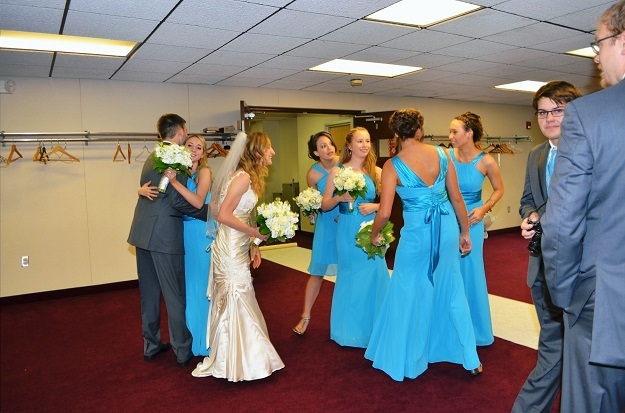 Hugs were exchanged, the receiving line was formed, and then it was off to take more pictures! I absolutely love the top detail and back of your dress! So pretty. It’s so cool that you had so many people you’re close to in the ceremony! Thank you so much, Leigha! It was so amazing to be surrounded by literally everyone I love all at once while celebrating the love that Jimmy and I share. It’s just an awesome feeling that I will never, ever forget! I just teared up reading this. you looked absolutely stunning and I couldn’t be happier for you. Awww, thank you so much Hollie!! You’re next and I’m so happy for you and Tim! Oh Ellie, it truly was a dream come true!! I couldn’t be happier or have asked for a more perfect, blessed day!! And as for kids…. I can’t even handle puppies haha!! Your dad shedding a tear makes me feel so warm and fuzzy. What a great story. These photos are GORGEOUS. It was the cutest (and most bittersweet) thing ever when my dad shed that tear. I will never forget that. Ever. How beautiful!! It sounds like everything went absolutely perfectly. Lovely! 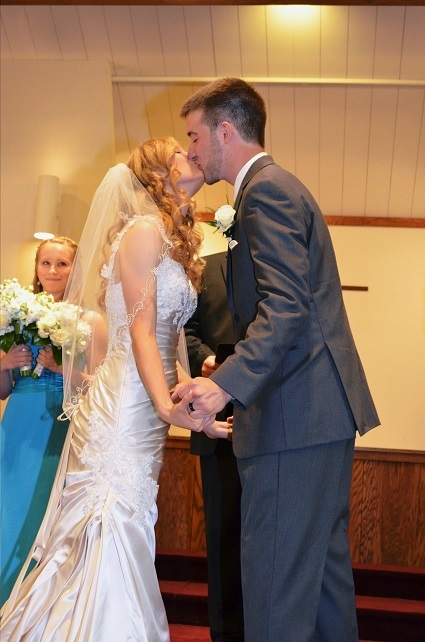 My little sister (and maid of honor) had a sweet look on her face when Christopher and I kissed too! So cute! 🙂 Also, I think it’s cool that you and Jimmy both have a brother and sister! Christopher has only one brother so there were a lot of things I had to explain to him about living with a girl when we got married, haha! Wonderful! You look so beautiful, and so happy. Your dress is gorgeous! Looks like it was an amazing day.